The hubby and I took a daytrip down to the Golden Triangle area this afternoon, about an hour south of Tupelo. The Golden Triangle refers to the towns of West Point, Columbus, and Starkville, Mississippi, although I’m not sure where the “golden” part comes in. The primary purpose of the trip was to locate the Golden Triangle Regional Airport, because I have a flight leaving from there in April and I wanted to make sure I knew something about how to get there before the day of the flight. We found the airport with no problem (and with the help of our handy Garmin GPS device), and then we decided to drive over to Starkville for lunch and coffee. I had the foresight, for once, to bring along my Nikon D700, a couple of lenses, and my tripod. Since we weren’t on a tight schedule I took the time to get a few snaps with both the Nikon and my iPhone as we explored some of the downtown Starkville area. We had lunch at Mugshots Grill and Bar, walked up and down the street a bit, and then headed over to Strange Brew for coffee before heading home. 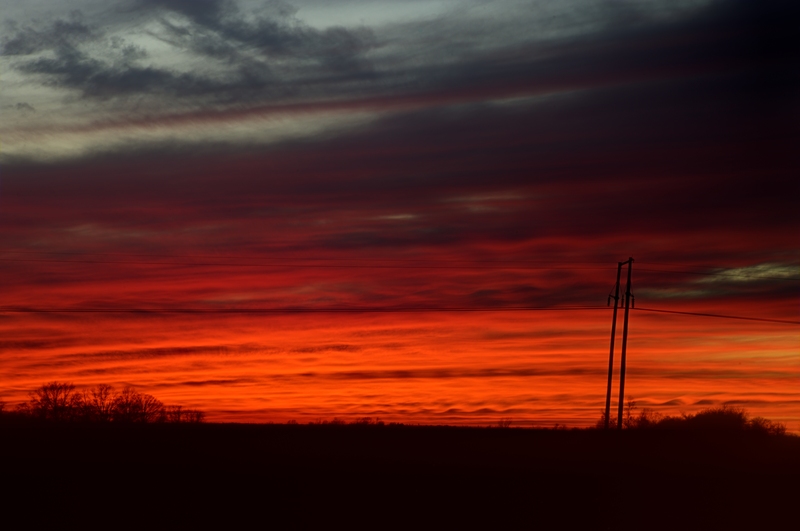 As we were driving north on US-45, it began to look like there might possibly be a colorful sunset, so we started looking for a side road where we could get away from power lines and traffic. We wound up about five miles off the highway along a little winding country road where we pulled off the road into a field and set up the tripod. I shot a few brackets there, but since the clouds were very low and heavy in the west it didn’t look like we were going to get the effect I was looking for, so we packed up the gear and headed back to the highway. As we drove away, Andy noticed the sign on the little community center building that indicated we were in Egypt. We had truly gone a long way to get this image!! This entry was posted in Uncategorized and tagged colorful sunset, golden triangle area. Bookmark the permalink.